Charming and unique strategy games that pack tons of interesting decisions into bite-sized matches. Easy to pick up, tons of variety and limitless challenge. The combination of procedurally generated matches and a single-player ladder means you can play BrainGoodGames for as long as you want. 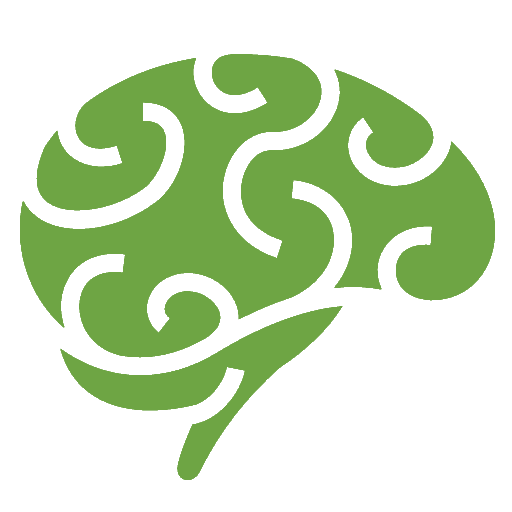 BrainGoodGames are designed to be low-stress but highly interesting. They're like single-player board games that keep generating variety and challenge. 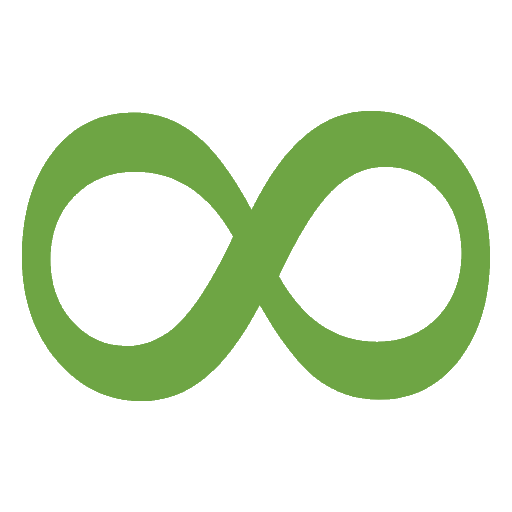 You can read more about the BrainGoodGames philosophy for game design here . 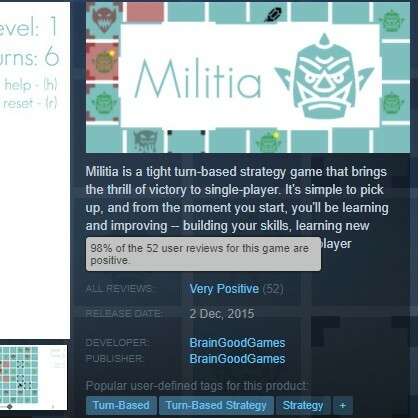 "[Militia] might be the best single player strategy game I've played this year." BrainGoodGames has done a fantastic job capturing boardgame elegance in a tidy videogame package. 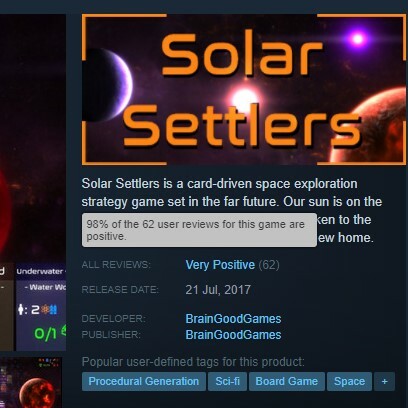 Solar Settlers ain't a bad cardy/boardgamey/roguey videogame. Have you played Militia or Hoplite? Both are super good. 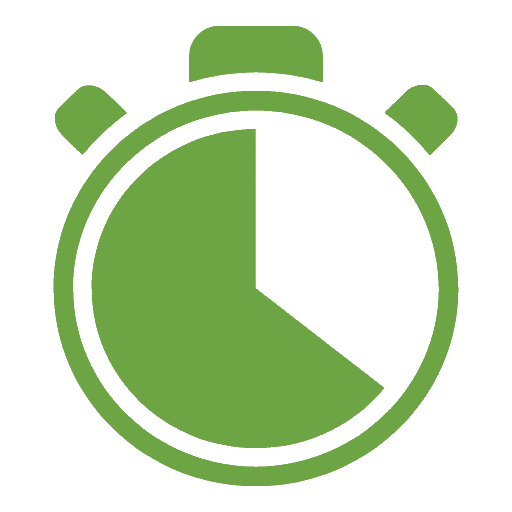 Bring a BrainGoodGame Home Today! A card-driven space exploration strategy game set in the far future. Harness the power of specific battle formations to push back the Minotaur hordes. 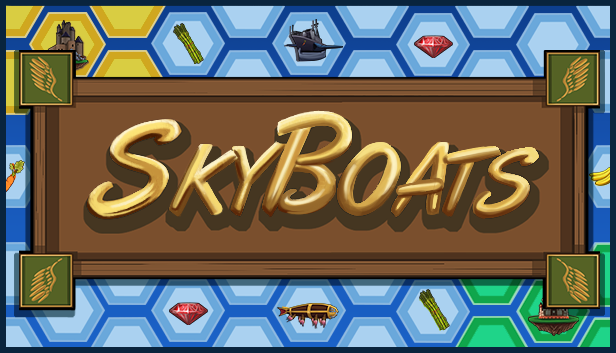 Today is your chance to learn to sail the skies, take control of the winds and discover vast riches up in the clouds. A deep and engaging single-player strategy game full of exciting decisions. Farm, build, survive! 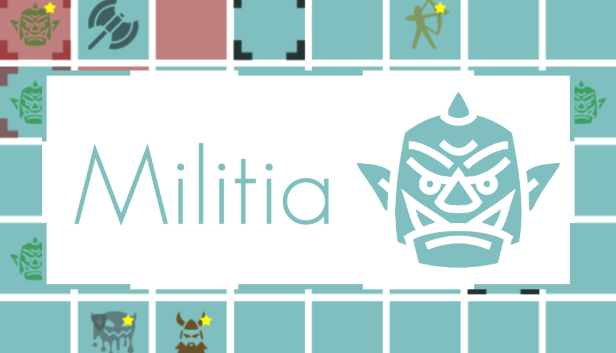 Militia is a tight turn-based strategy game that brings the thrill of victory to single-player. Growing your space-colony, chopping a Minotaur down to size and sailing the wind currents! 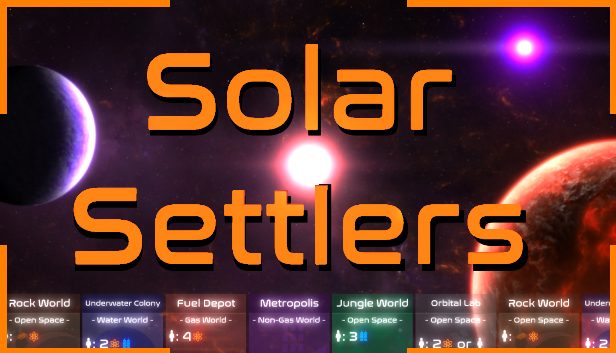 "[Solar Settlers] strikes the balance between casual fun and strategic gameplay." 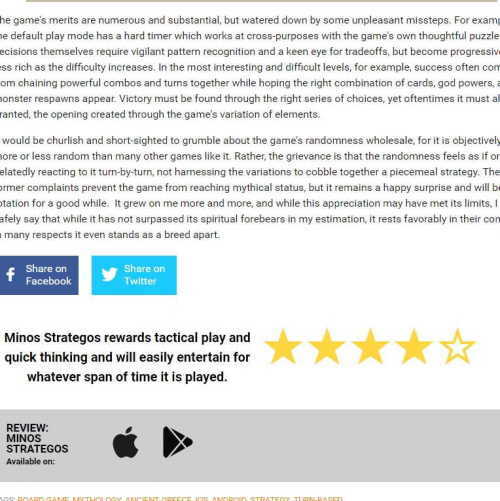 "An absolute gem of tactics and strategy, in a tight little package of awesomeness." "Every game from BrainGoodGames is now a must buy on release day for me." 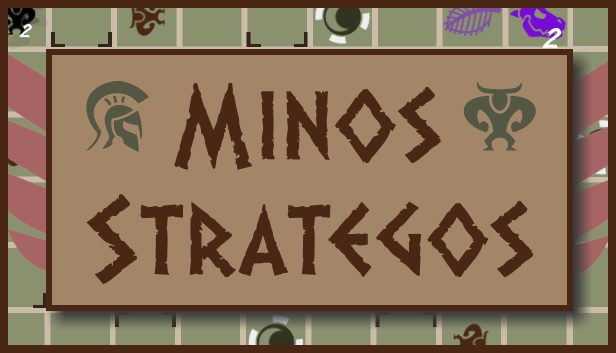 "Compact, elegant strategy game that is easy to learn." "This game is one of the best designed games I have played." 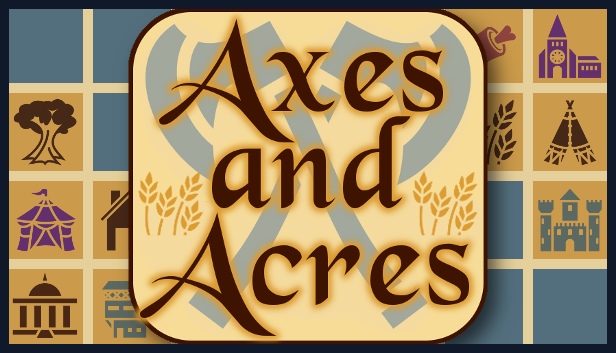 "Really cool board game; among the best I've played physical or virtual. Distinctive, fun, elegant, replayable. Well worth $10"
"This is an excellent card and resource management game, really quite outstanding design." Have feedback? 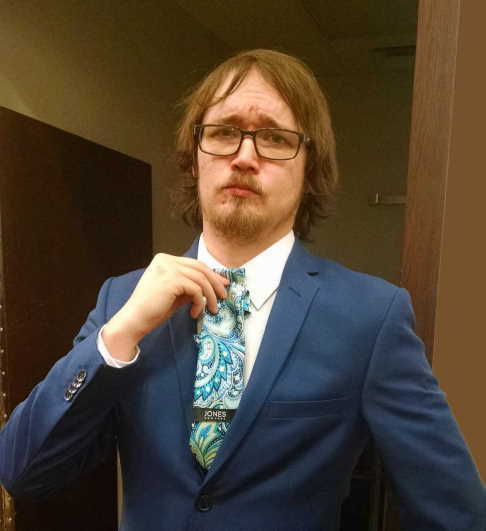 Wanna chat about games? 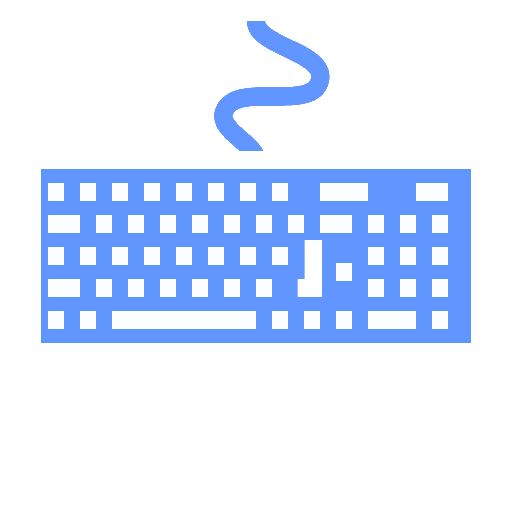 Join a community of friendly like minded gamers in the BrainGoodGames Discord! 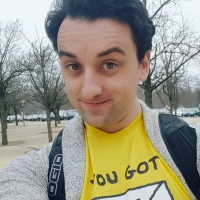 I also ocassionaly host BGG tournaments! If you reeeeally like BrainGoodGames (or have more money than you can spend somehow) you can support me on Patreon! You get some cool perks and I really appreciate it! Uhhhh, hi! I'm Brett! I love designer board games, music and nature walks. 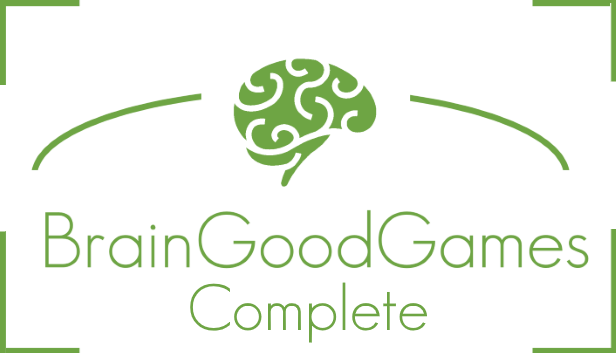 I design, code and publish BrainGoodGames. Check out the BrainGoodBlog for game design thoughts, tournament annoucements, patch notes and dev log. Follow on twitter for twitch stream live annoucnements, WIP screenshots, game updates and annoucements. 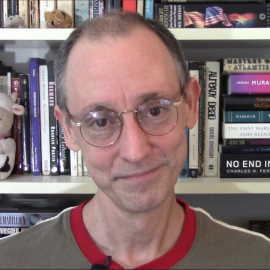 Keep up to date on BrainGoodBreakfast episodes, launch trailers and tutorial videos!